CCSN was pleased to welcome back Trina Fraser, part of the Cannabis Law team at Brazeau Seller Law Firm. Brazeau Seller Law’s CannaLaw® group has been advising cannabis industry participants since the inception of the Marijuana for Medical Purposes Regulations in 2013. Their cannabis team is also preparing employers for the legalization of cannabis by creating and updating substance-use and human rights’ accommodation policies, and advising on rights and obligations relating to cannabis use in the workplace. 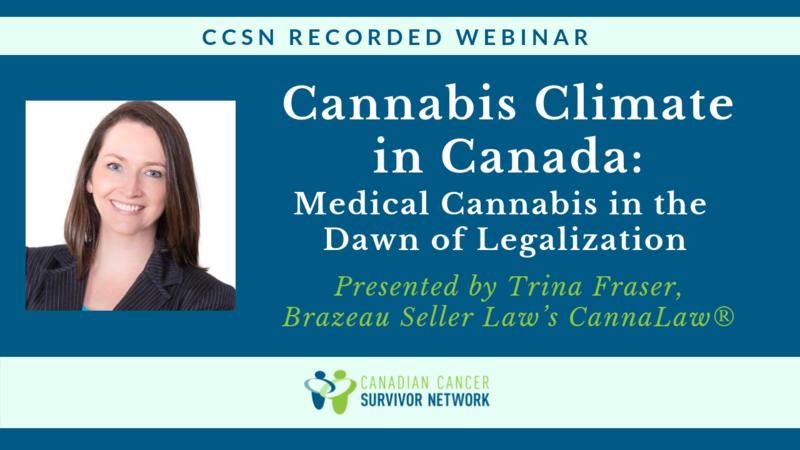 In this webinar, Trina discussed the Cannabis Act, which came into effect October 17th. In particular, she highlighted how medical cannabis may be affected by these new legalization guidelines. The webinar was followed by a question and answer session for attendees.